Outdated and inefficient systems prevent many companies from maximizing their effectiveness in the digital economy, Katipult Technology (OTC:KTPPF) co-founder and CEO Brock Murray said. That’s a statement borne from personal experience in private capital markets where many companies operate within a highly manual, paper-laden environment, Mr. Murray explained. He saw it, he lived it, and he never wants to go back to it. The pain points in capital raising are legion, Mr Murray said. Getting documents signed and then safely storing and accessing them, facilitating payments and undertaking KYC are but a few. It’s also a global problem, as executives from Singapore, Australia, Africa and the United Kingdom are using Katipult’s technology to their benefit. 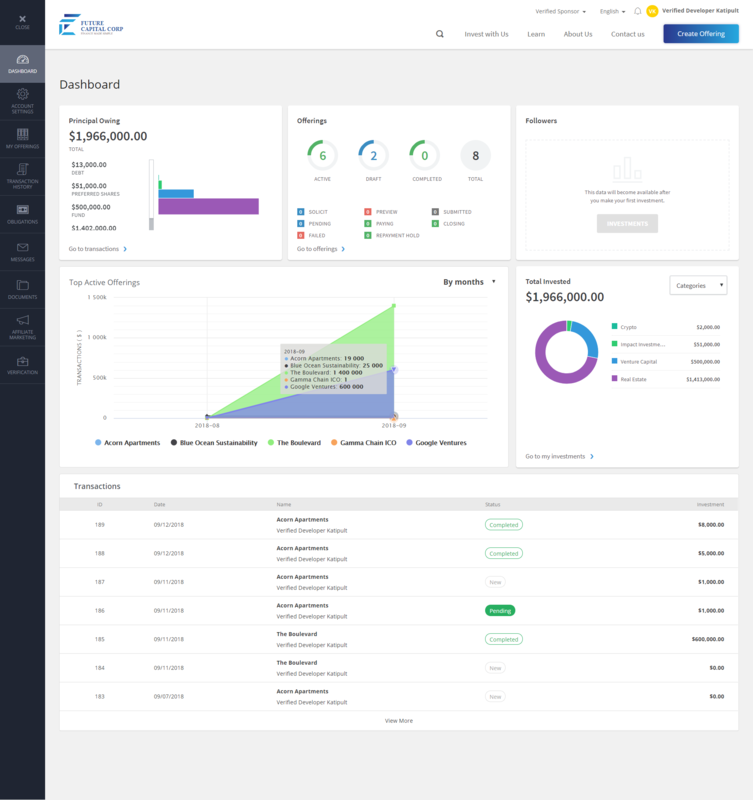 That technology begins with investment management software which allows users to get a clear and current view of their entire investor network on a clean dashboard. It addresses investor servicing and reporting cycles, document access, distribution processing, automated messaging, analytics and advisory services. Investor onboarding occurs with a click and detailed reports allow companies to better understand their clients. Katipult Technology also offers investment crowdfunding software allowing users to leverage general solicitation and crowdfunding exemption rules to raise capital from high net worth and retail investors. Opportunities can automatically be sent to the entire investor base and complementary tools foster social media engagement. Additional technology facilitates trading. Sector specific solutions are provided for real estate, private equity and P2P lending. Key to developing all of Katipult’s technology was close contact with early customers and regulators who provided crucial feedback, Mr. Murray explained. And when you are building technology to meet a global need in industries with country-specific regulations, frequent contact with regulators was advisable. Mr. Murray credits the United States for taking a progressive approach. Those unique national requirements occur as social media channels provide the ability to market around the globe. They sure do when it comes to cryptocurrency, Mr. Murray said. While everyone thought the JOBS Act would propel crowdfunding, the real beneficiary has been cryptocurrencies, where companies can raise millions in minutes. Another key contributor in the digital age is mobile technology, Mr. Murray said. In the most progressive countries, people need to follow calls to action on their mobile devices, so Katipult designed their technology to be fully responsive on mobile. Some smaller jurisdictions are making some smart moves in cryptocurrency, Mr. Murray said, citing Gibraltar and Malta as two examples. Early on they recognized all capital raising will eventually be conducted online with improved transparency and liquidity. What has also happened is the technology has improved the ability to trade on secondary markets, find more investors, and deliver greater returns. But they still have to move money across borders, and that is what blockchain enables, Mr. Murray said. And smart contracts add trust. But are enough of the key people aware of the benefits blockchain brings? While the average person has what can be charitably described as a rudimentary understanding, it’s up to the companies to make technology that can be mass consumed, not up to customers to understand it enough to consume it. “The big art of adoption is simplifying it down so anybody can do it,” Mr. Murray said. Take the familiar investment processes that everybody knows, develop technology that simplifies it while instilling confidence with investors that it is indeed the same process but only better. The race is on to do exactly that.